B U B B L E G A R M: We made some jam! 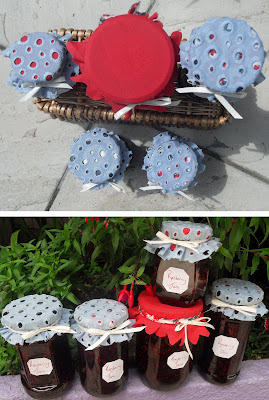 And added some ribbon and labels... and did this mini photo shoot in the garden! i love raspberry jam! home-made jam is always the best :) hope your enjoying your new place. I make Jam with fruit from around the farm when I go home. I'm never inspired to when I'm up in Manchester, I reckon my housemates would eat it all! @sakeenah thanks, homemade is the best, no additives no nothing, perfect! Whats nice about making your own jam is that you know whats in the jam and sometimes when you buy jam from the store, your never sure whats really in those jams to begin with!! Plus homemade jam taste better then store bought jams!! My mouth just watered up as I looked at those beautifully packaged jars of jam. It looks delicious. That is so cute! I'm going to try this out as soon as I have an empty jar. Your MIL must have quite the garden! 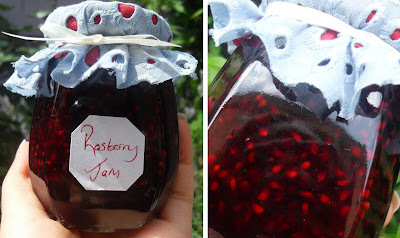 the raspberry jam looks yumm!!! ps...congrats on winning laalaas contest!!! Awesome! They look cute & deliscious! Love jam! Aww a little jam photo shoot. They look delicious! I recently purchased a book full of jam recipes and how to make picked tomatoes etc. I'm even more excited to try out some recipes now. How did you cover your jars like that? Did you first tight seal some plastic wrap around them and then decorated them with that gorgeous cloth? The cloth makes them look so pretty. You've totally inspired me on this one! mmhhh, I love homemade jam. it tastes so good. congratulations on winning laalaa's contest! I really liked your look.